5 Top Tips From a Dentist On Staying Healthy During Flu Season! Sometimes, no matter what you do to avoid it, you still come down with a cold, or worse, the flu. And while it’s understandable that the very last thing you’d think about is your teeth and gums, you might be surprised at how much having a clean, healthy mouth can make you feel better and avoid some of the oral health pitfalls you can encounter when you’re sick. Below are 5 simple tips from a dentist for how to feel better this cold and flu season and also maintain a healthy smile at the same time! It’s tough to keep up with your oral hygiene routine when you’re under the weather, but do the best you can. If you can’t brush twice a day, aim for once. You can also swish with a fluoride (anti-cavity) mouthwash, which is easy to use and very effective for strengthening your teeth. Extra fluids are crucial, but try to make water your main beverage of choice. If you want to drink juice for the vitamin C, be sure to rinse your mouth out with water several times to wash away residual sugars. Drinking a lot of water is also a great way to counteract dry mouth, which is a common side effect of being sick and can increase your risk of cavities. Gargling with salt water several times a day at the first sign of a cold or flu can actually stop it in its tracks. It’s a safe, inexpensive, and effective way to kill bacteria and also soothe the soft tissues in your throat. It’s easy to go through a lot of cough drops when you’re sick, but that can be a recipe for disaster if they contain sugar. Since the risk of getting cavities goes up the longer sugar stays in your mouth, dentists recommend avoiding things like hard candy or gum that contains sugar. 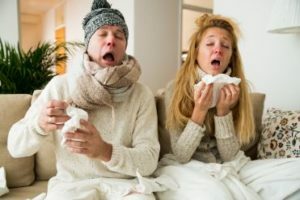 Most people wouldn’t think of cough drops the same way, but they can be just as bad as candy, especially when they’re used throughout the day for several days in a row. Fortunately, there are multiple sugar-free varieties available that are easy to find in the store! Once you feel better, it’s a good idea keep up with your regular checkups to help prevent problems and catch any potential issues when they’re small and easy to fix. Also, one last thing to note: There’s a misconception that you can get sick again if you don’t change out your toothbrush, but unless you have a condition that weakens your immune system, the chance of re-infecting yourself is low. It’s never a bad idea to get a new toothbrush, but it’s not entirely necessary. No one is immune from cold and flu season, but with these 5 tips, you can make sure your mouth stays healthy – even when you’re not! Dr. J. Peter St. Clair has over 20 years of experience as a general, restorative and cosmetic dentist. With a focus on prevention, he’s dedicated to helping his patients take care of their oral health and general health at every time of year, including cold and flu season. If you have any other questions about staying healthy this winter, he can be reached through his website or at (978) 465-5358. Comments Off on 5 Top Tips From a Dentist On Staying Healthy During Flu Season!